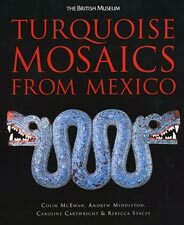 Many of the Aztecs’ secrets are revealed in a forthcoming book ‘Turquoise Mosaics from Mexico’, by Colin McEwan, Andrew Middleton, Caroline Cartwright and Rebecca Stacey, to be published in October 2006 by the British Museum (price £12.99); here, with the team’s kind permission, we offer a tiny pre-view, to whet your appetite! 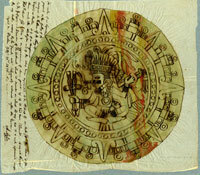 the close-up images show fine details of the famous double-headed serpent (a metaphor for twins) in the Mexico Gallery of the BM. 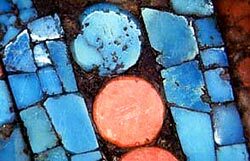 Notice first (pic 1) how different colours and sizes of turquoise tesserae are used on the ‘eyebrows’. This also shows the way that relief is often used to delineate (emphasise) design on the objects. 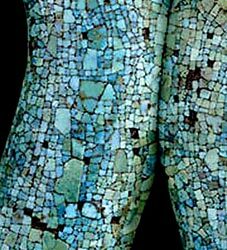 Next (pic 2) the ‘snakeskin’ effect of the turquoise on the body. Finally (pic 3) the decorative use of round pieces of shell across the nose (an unusual design because the resin adhesive is allowed to show and become part of the design itself). 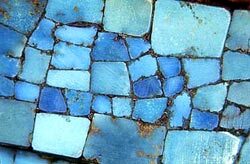 The BM team gave a striking presentation of some of their new research work on the Tezcatlipoca skull mosaic - one of the 9 turquoise mosaics in the BM - at the recent Tezcatlipoca Symposium in London.